Last week we discussed why you should switch to natural and organic beauty products, and what you should look for when you’re shopping. Today I want to specifically discuss the benefits of natural exfoliants, especially those with natural enzymes, which can yield an instantly brightened and smooth complexion. Do you know the ingredients in your exfoliant? Not only should you be looking for products that contain certain ingredients like natural exfoliants and enzymes, but there are also things you want to avoid. One of these ingredients to avoid is microbeads. Check your labels for the ingredient “polyethylene,” which is the term for microbeads. If your product contains this, you may want to rethink your beauty routine. Recently there has been a large concern over the use of microbeads in cosmetic products. Microbeads are tiny little balls made of non-biodegradable plastic. Since they are cheap to produce, they are often found in inexpensive skincare products you find in drugstores. Although tiny and seemingly harmless, these microbeads actually cause a lot of environmental damage. It turns out that when you use these products in the shower or sink, the tiny beads go down the drain and end up in rivers and lakes, causing pollution problems. Fish eat these tiny beads, which are toxic to them. Then when other species (like us) eat the fish, the toxins are spread throughout the food chain (source). According to the New York Times, several states have already passed laws restricting microbeads, including California, Colorado, Illinois, Indiana, Maine, Maryland and New Jersey, due to these harmful environmental effects. Not only are microbeads dangerous to the environment, but there is debate on whether they can cause damage to your skin as well. Some say the beads are too small to penetrate the skin and cause damage, but other sources say that the little plastic beads can actually cause microtears in your skin, and that many dermatologists warn against them because they are too abrasive (source). Either way, I personally don’t like the idea of rubbing plastic on my skin, and much prefer the idea of only using natural exfoliants. It’s time to ditch those cheap scrubs for good, and replace them with natural exfoliants that are actually good for your skin (and not bad for the environment either). There are some really amazing natural alternatives to microbeads, such as sugars, salts, powders made from nut shells, bamboo, rice, etc. These natural exfoliants are just as effective, and are also much gentler on the skin (source). All of these examples are types of mechanical exfoliation, meaning that you are physically rubbing something against your skin to slough off dead skin and impurities. This is usually the type of exfoliation that we are used to. Another natural way to exfoliate is through enzyme exfoliants. There are enzymes found in certain fruits, like pineapple and papaya, that act as natural exfoliants, removing the dry, dull skin cells by digesting the proteins of the outermost layer of the skin into smaller fragments, preventing a build-up. Using enzyme exfoliation can yield an instantly brightened and smooth complexion (source). I think we all like that idea! 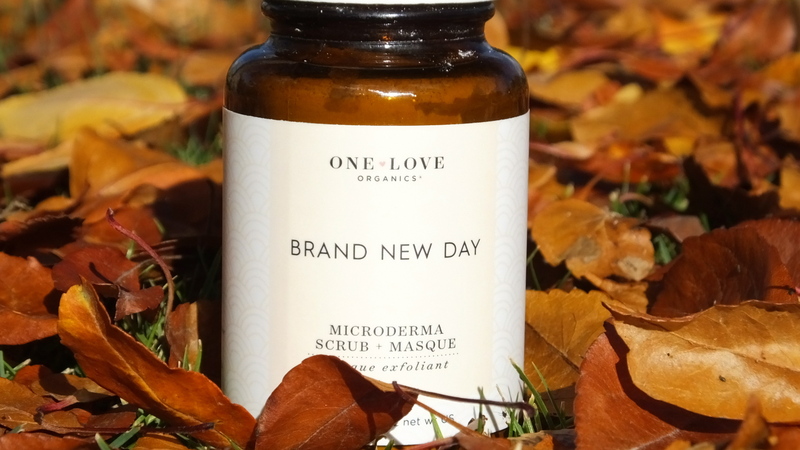 I have actually experienced that “instant glow” from a natural exfoliant that I am currently using from One Love Organics, called “Brand New Day.” More than once, my boyfriend has said out of the blue that my skin looks really good right after I use this product. This natural exfoliant combines organic sweet pea flour, pineapple enzymes and mineral rich kaolin clay. It comes in a powder form (the lack of water means there is no need for a preservative! ), which you sprinkle into your palm and add water to form a paste. The product has a mildly scrubby feeling from the sweet pea flour, and leaves your skin feeling ultra smooth and clean. My pores always appear smaller and feel like they can breathe better after I exfoliate with this enzyme cleanser. The box that it came in says, “Hello, Insta-Glow!” which I think is a totally accurate claim. This is a great natural exfoliant to try because 100% of the ingredients are from natural origin, 64% are from organic farming, and it only has 6 total ingredients. I am loving it and can’t wait to try more products from One Love Organics*! I hope today’s article opened your eyes to the dangerous ingredients that can be found in your exfoliating products, and inspired you to give natural exfoliants a try. I used to love the clean feeling of a scrubby exfoliant, but I do not miss microbead products at all since switching to natural alternatives. My skin is softer and clearer, and I feel good about the ingredients in my products. Give it a try! *At this time, I am not affiliated with this company (although I would gladly support them). These opinions are my own!